IoT (or Internet of Things) may seem like the buzzword of the year, but the fact is that even if the scope of IoT applications is only partly visible today, the technology is standardizing fast and strategic positioning for players who may have a role in this market has to happen very soon. IoT is often seen as a mobile technology, but the particular data requirements of sensor communications and the long range of existing solutions make it perfectly feasible for most fixed broadband operators to deliver as well. The core question for them are why and how. These are the two questions that this new report ‘Entering the IoT Market as a Broadband Operator’ aim to answer. Depending on the current position in the broadband market (national, regional or municipal provider), on ambitions in the service space and on existing internal needs for IoT we recommend different courses of actions and do an overview of the relevant technologies worth examining. 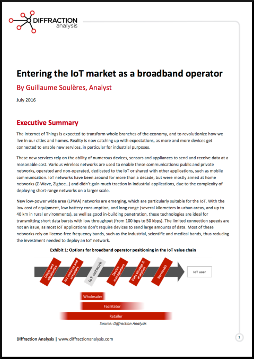 We also analyze the value chain of IoT as seen from the broadband operator’s point of view, as well as the pricing issues that may determine the viability of a business model in this area. Finally we explore synergies between the fixed operator’s business and the possibilities offered by moving into IoT. The report is available for direct purchase via Paypal (with any authorized credit card) or you can contact us for a more traditional payment method.